A little while back, a little gem appeared as if from a cloud of smoke onto the DSiWare service – Go! Go! Kokopolo, from young indie developer Tanukii Studios. In speaking with Keith Webb, the company's founder, we discovered that he was also its only member. Indeed, he occupied just about every imaginable role in the creation of this game. We decided to take a deeper look at Keith's development process and the ideas and artistic impulses that factored into the creation of the world of Kokopolo. Nintendo Life: Would you please give a brief description of Go! Go! Kokopolo for the uninitiated? Keith Webb: Go! Go! 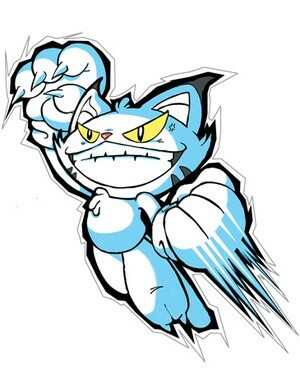 Kokopolo is a fast paced, action-packed arcade title exclusively for DSiWare and the 3DS eShop. 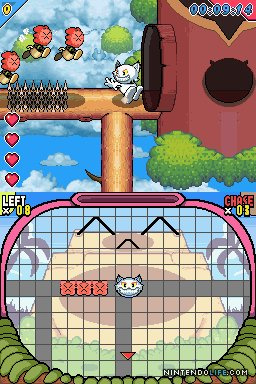 You take control of Kokopolo, a crazy, hyperactive wildcat, who is hell-bent on disturbing the peace after he has been accidentally awoken from his peaceful afternoon slumber. It’s a top-down, Bomberman-style viewpoint arcade-action game, where your aim is to scratch as many innocent enemies as possible, and get them to chase you around crazy mazes, avoiding hazards and obstacles, until you lure them to their doom in the bellies of carnivorous SnapSnap plants! There are 80 stages in all, including ten unique boss stages, and as you get further into the game, more mayhem is thrown into the mix. In short, it is crazy, pure arcade mayhem, wrapped up with beautiful pixel artwork and fantastic stylised graphics! Great fun for everyone, in fact! NL: What were your initial inspirations in creating Go! Go! Kokopolo? KW: Well, I'd always wanted to try my hand at developing an old-school arcade style game, like the ones that Taito and Namco used to make back in the late 80's. They'd always focus on a simple idea that could be picked up and played, and quickly learned, but difficult to master. The kind of game that could be played in short bursts here and there. The premise for the actual gameplay mechanic came from a variety of different sources, though. Interestingly, the actual idea for the scratch and chase mechanic was not inspired by other arcade games, or a long brainstorming session. It was actually inspired by a series of real life events. When I was younger, a few years back, a stray white cat appeared in my parents back yard, and refused to leave. After a week or so, we concluded that it had either been abandoned, or it was a wild cat, but we took pity on it and let it into the house. That cat became a member of the family, but for some reason, particularly with me, it had a very mischievous, almost psychotic side at times. It would stretch out on the floor, and act all cute, tricking you into stroking it, and then, without warning, jump up at your face and try to scratch your eyes out! As soon as it had attempted that, it would dash off crazily to some random location in the house. Of course this scared and angered me at the same time, and my instinct was to chase it. Somewhere in the back of my mind, this strange encounter led to the main premise of what now became, "Go! Go! Kokopolo"! "The heart-pounding aspect of not knowing exactly what is ahead, but the danger behind is keeping you on your toes, was key"
NL: That's fantastic. In the game, you're basically playing as a bad guy, running around and causing mischief. Why do you think you were inclined to feature such a non-hero character in the starring role? KW: I think it's adds a lot to the mischievous fun aspect of the game. When I first brainstormed the whole idea for the main character, I had Kokopolo as a cute hero type, with a big friendly smile, and happy expression... but just by changing the shape of his eyes, he quickly changed into a more of a trickster type character, and that fitted with the unique gameplay mechanism quite well. Obviously, once I'd done that, I had to make the "enemy" characters into more laid back and peaceful personas, but as with most Japanese-style arcade games, the enemies have that cute look about them anyway! I specifically made sure that the first enemies the player encounters would be neither offensive or defensive, just simply happy creatures going peacefully about their business. Interestingly enough, on a deeper level, all Kokopolo is doing is presenting the "enemies" with an option of whether or not to follow their instincts, or simply ignore them and carry on going about their business. After being scratched, the enemies could just simply shrug it off, and they would come to no harm.... however because they react in such a hot-headed way, and chase Kokopolo without any considerations for the dangers they may be lured into, this eventually leads them to their own demise! The motive of the game is exactly the same for Kokopolo himself... he could have simply shrugged off the accident that led to his madcap revenge-fuelled psychotic spree, and not participated in his vengeful shenanigans, and all would still be peaceful, but instead he chose to follow his hot headed temperament. NL: There's certainly quite an array of interesting in-game mechanics here. Can you tell us about fleshing those out? KW: Well, we've got the chase mechanic, which was obviously inspired by the earlier story, but that was really fleshed out by looking at games like Pac-Man and Flicky. I was also inspired to see what would happen if we took the Pac-Man mechanic and reversed it, so instead of fleeing, and then getting a power up to chase the enemies, you actually flee to your advantage. The popular game Snake was another obvious inspiration, in which the longer the chain, the more deadly it becomes – but also the more rewarding. Once the chase mechanism was decided upon, I wanted to flesh out a load of scenarios, obstacles and hazards that fitted in with the overall aspect, but they had to be situations that wouldn't slow the player down. The heart-pounding aspect of not knowing exactly what is ahead, but the danger behind is keeping you on your toes, was key to this. The enemies themselves were originally designed to be based on fruits and vegetables, and that was an overflow from an idea I had in the past of feeding food-like enemies into other animals, kind of like an old Sega puzzle game called Baku Baku Animal for the Sega Saturn. With the lower touch screen aspect, it made sense to have this as the stomach of the carnivorous Snap Snap plants, and a quick roulette style mini game was added to keep the top and bottom screen work as a sort of gameplay loop. All of these ideas got mixed together, like a crazy recipe, and Go! Go! Kokopolo is the end result! "On a deeper level, all Kokopolo is doing is presenting the 'enemies' with an option of whether or not to follow their instincts, or simply ignore them and carry on going about their business." NL: How did you go about designing the levels, routes, loops and enemy placement? KW: Initially a majority of them were designed roughly on graph paper, just quickly sketched out with the basic routes, start points, and the placement of the Snap Snap plants in each level. I had originally planned to do just 40 stages, set across four different worlds, but when I upped that number to 80 stages over 10 worlds, I had to re-look at how the routes would work with the specific tile set of that stage. Some levels were simply designed from a gameplay perspective, in that I chose where to put specific hazards, and enemies purely from a pacing issue, but others were designed from another perspective, in that I would have an idea of what environment I wanted to create, and then I had to map the routes to that in order to make it work. A good example is the stage F-2, where it is set in a beach environment, with construction girders crossing over the ocean. This environment had obviously been inspired by a stage in Super Mario Sunshine, but as Kokopolo is a very linear and tight game, the routes and the tile set had to work together harmoniously. In some of the other stages it was simply a case of dressing up the stage in the specific tile set once the layout had been finalised, but in this one in particular a lot more thought went into it. It's interesting, thinking back to it, as when I initially laid out the rough levels, there were hardly any loops at all. The levels were full of dead ends! A quick playthrough of the game made it obvious that this was far too unforgiving and frustrating, as once you started down a path, you obviously couldn't turn back easily, and so were guaranteed to fail. It seems so obvious now that the levels had to include a lot of looping areas so that you could continue to run, but back then I hadn't really thought it through properly. I guess that was one of the things that you face when going with a unique design, the rulebook hasn't been written yet, so you have to write the rules as you go along. Thankfully all – most – of the dead ends were removed from the final game, otherwise it would be even more frustrating than it currently is! Enemy placement was another interesting issue. I learnt that small graphical touches can have quite a big impact in this regard, as I worked out that by simply having small visual differences in the environment, such as paths, under the enemies routes, then the player instinctively knows where the safe spots are. This was something that I worked out when designing the stages, and hadn't considered before. I really like this game and the artwork is great. I would draw some fanart but I can't draw to save my life. Also the stuff about them never meeting face to face is astonishing! As mentioned in our previous interview, I'd be very interested in doing a couple of Kokopolo sequels. I can tell you now that the third game will be entitled "Kokopolo Paradise" and will have more story based and simple RPG based elements in it, with a humorous narrative running through. Yes, sequels! But what's that talk about the third game? I haven't even heard anything about a second game in the series or did I miss something? A great read. It's always interesting to see how much goes into developing these download games, and in the case of Go! Go! Kokopolo that effort really shines through. Thanks for the reminder about this game. I finally got around to downloading it today, and I love it! I also wonder what that stuff about Ninty being strict with the microphone is about and wished the rating-guys would play the games themselves and only contact you if there's stuff they can't pull off themselves. Looking at what you get out of many $35-40 retails DS or 3DS games, $8 for this wonderful little game is a heck of a steal. I hope these devs stick around to create more eShop content; we need them.